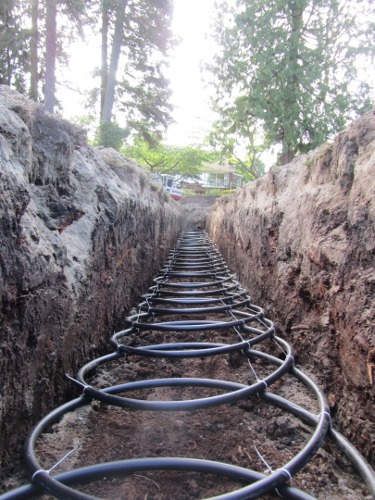 Slinky loops are made of geothermal pipe that is coiled into many loops and buried in horizontally dug trenches in the earth. This loop requires more pipe, but less land (and excavating cost) than a single pipe trenched horizontal loop. It will often require a larger diameter pipe, and thus more antifreeze (making it more costly), than a single-pipe, trenched horizontal loop.